Fruit Fly Mania - Kenya Biologics Ltd. Female fruit flies deposit their eggs in healthy fruits. The larvae that emerge in the fruit cause damage to the fruits. Fruit flies are very mobile; it is therefore difficult to control fruit flies by spraying conventional insecticides. 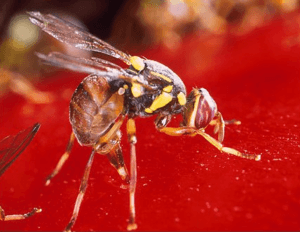 What is Fruit Fly Mania? Fruit flies need specific proteins to survive and mature, in addition female fruit flies also need proteins to mature their eggs. Fruit Fly Mania is a protein which is highly attractive to both male and female fruit flies. It attracts all common species of fruit flies such as African invasive fruit fly, melon fly and mediterranean fruit fly. It has specifically been developed for African conditions. How to use Fruit Fly Mania? Fruit Fly Mania can be used in the following two ways: (1) spot sprays on the inner canopy; or (2) in a bait trap. Spot sprays are easier for rapid application. Traps can be used in smaller orchards. 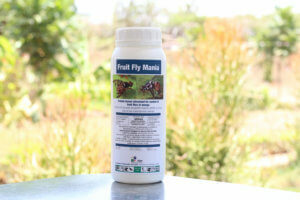 Mix 100mL of Fruit Fly Mania with 900 mL of water and add (bio-)insecticide. Use a sprayer with a big nozzle; 4-6 mm (4000-6000µm) droplets will improve efficacy. Apply 50 mL of the mixture on the undersurface of leaves per tree. 10 Liters of this mixture is needed per acre (thus 1000mL of Fruit Fly Mania). Kenya Biologics is currently developing a pre-mixed bait spray. We will keep you updated. Put 300 mL in a Fruit Fly Mania Trap. Hang 30 traps in one acre for good control. There is no need to use an insecticide as the trap is designed to keep the fruit flies in. When handling pesticides always use Personal Protective Equipment such as rubber gloves and read labels carefully before handling. Store the Fruit Fly Mania in its tightly closed original packaging in a cool, dry and dark place. Shelf life of Fruit Fly Mania is 12 months from date of manufacture. Store pesticides always out of reach of children. Dispose Fruit Fly Mania through burning.